2018 was quite the year for insect pests. We saw a huge increase in Japanese beetle numbers, as well as a large population of grasshoppers. Lets discuss these and other insects seen this year. While my viewing area is limited to Northeast Kansas and Southeast Nebraska, this seems to be a hotbed for insect activity. With hot, dry summers, and cold, wet winters, we can get a mix of insect problems that constantly hit us. As summer temperatures hit us extra early this year, and the dry weather continued over from 2017, we were hit hard and early with an abundance of grasshoppers and locusts. These chewing insects devour many different species of plants and can be difficult to treat. Lawn treatments to kill hatching eggs in spring seem to be the best. My son and I also enjoyed hand catching grasshoppers and feeding them to fish in a friend’s ponds. Maybe next year we will use a butterfly net. Lots of grasshoppers usually means an outbreak of blister beetles. The larvae of these beetles feed on the eggs of some species of grasshoppers, as well as on ground-nesting bees and other blister beetle eggs. 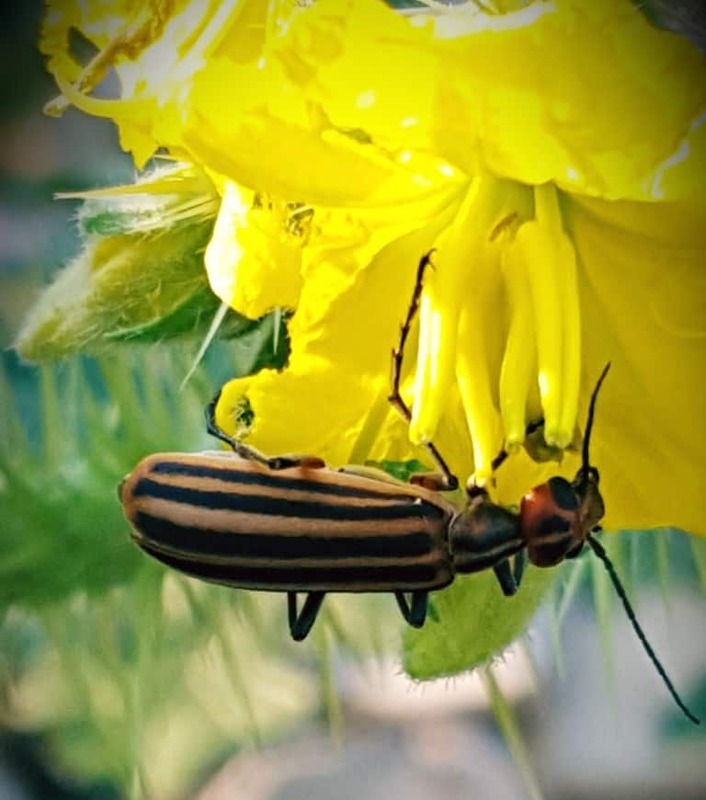 There are three main types of blister beetles in our area: Striped, Black, and Grey. I was saw all three this year. 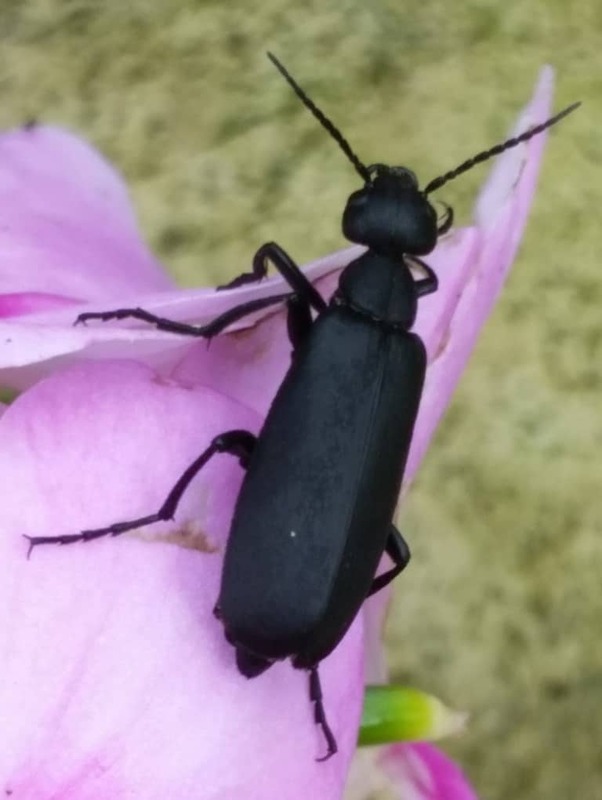 The adult blister beetles feed on plant materials, enjoying many things but especially loving hostas, anemones, and members of the nightshade family. Luckily, they are easily killed by either handpicking (wear gloves) and dropping into soapy water, or by spraying with and insecticide (Bifenthrin). Dusting plants with diatomaceous earth also works well, but must be re-applied after rains and dew. On to Japanese beetles. Yikes! After heavy infestations around Atchison and Hiawatha in 2017, they really broke out this year. First sightings of Japanese beetle in Sabetha were discovered and many people were inundated with the pesky beetles. The big problem is that they are not picky eaters, they go for most anything. Luckily for us, they prefer to start with certain species before moving on to others. Lindens, roses, evening primroses, thistles, and peaches tend to get hit first and hardest. With a carefully timed chemical application, most of the beetles can be killed on these species. At my own home, I went out daily to handpick them from my four-point evening primroses and drop them into soapy water. Overwintering larvae can be killed with a grub treatment to lawns in mid-summer. It was another hard year for bagworms at many places. Even though sprays for bagworms kill as many as 95% of feeding larvae, a single overwintering egg sac can contain 500 to 1000 eggs for the next season. These hatch in stages, from mid May to early July. Spraying must be timed in 2 to 3 week intervals, at least twice to get good kill on feeding larvae. Many chemicals will kill bagworms, but the best are Spinosad and Bifenthrin. Hand picking can be done on smaller trees and shrubs if you want to avoid chemical use. Bagworms primarily affect junipers and spruces, but may also be found on a variety of deciduous and evergreen shrubs and trees, including willow, maple, rose, viburnum, and much else. Another pest seen more of this year, but not particularly problematic, was leafhoppers. Leafhoppers have piercing-sucking mouthparts and primarily feed on a variety of plants, sometimes host-specific per species. They come in a wide range of colors and sizes and jump quickly from plant to plant if disturbed. While, they are not a problem on larger trees and shrubs, they can be a nuisance on annuals and perennials. However, most are kept in check with natural predators like lacewings, lady beetles, and spiders. We have not heard much about Emerald Ash Borer this year, as it has not been detected in any new counties of Kansas. However, it was discovered in new areas of Nebraska, Iowa, and Missouri. I expect we will be finding EAB in more Kansas counties in the near future. What to look for? Check for tiny, D-shaped holes in the trunks of ash trees, anywhere from 6 to 25 feet above ground. Also look for canopy loss of 1/3 to 1/2 in a single year. Have a state forester or Grimm’s Garden Arborist check your trees if you are unsure. Looking forward to less-pest year in 2019. Happy planting!